Coastal Pipco can see your project through from conception to system start-up. Designing an efficient system is our top priority. The initial price of a system is important, but more importantly how much money an efficiently designed system can save our customer in the long term. An irrigation system, if designed efficiently, is an investment that will increase profit by lowering operating costs. 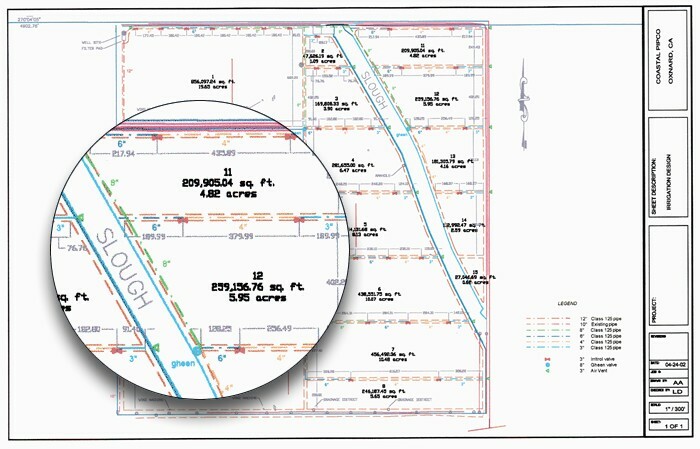 Our design department utilizes programs such as AutoCAD LT2000, IrriCAD Version 6, and RainCAD 7.0. As part of our design work we not only supply system drawings, we also supply detailed drawings of the system components such as filter stations, valve hook-up, and pipeline hook-up, which aid in installation. All designs are stored in our database and copies are available upon request. We can also supply installers with laminated copies for their crews. Click on the icons below for sample design drawings. All design bids are line item detailed, which allows our customers to have a firm understanding of what they will be spending. Click on the icon below for a sample bid. We have staff qualified to evaluate and troubleshoot pending or existing hydraulic systems including filtration, pumps and valves. Our staff regularly attends training seminars conducted by the manufacturers of the products we sell to aid in troubleshooting equipment in the field. Coastal Pipco stands behind the equipment we sell. We offer repair and troubleshooting services for equipment under warranty, with no labor charges, when equipment is purchased from us. In addition, we also offer the same services for equipment purchased elsewhere for a nominal labor fee. Coastal Pipco, over the years, has developed relationships with many qualified contractors/installers in the Tri-county area. As a compliment to our designs we can provide a list of recommended contractors/installers to our customers. The continued education and product training our staff receives is passed on to our customers through seminars offered several times throughout the year. We encourage you to contact us regarding upcoming seminars and training sessions.